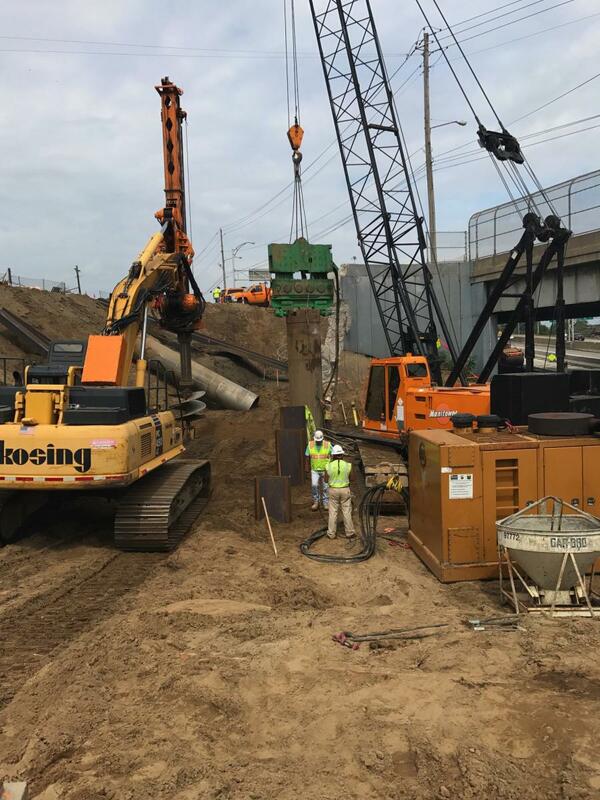 As part of its multi-phase Cleveland Innerbelt Modernization Plan, the Ohio Department of Transportation is spending $28.9 million on the construction of a new frontage. As part of its multi-phase Cleveland Innerbelt Modernization Plan, the Ohio Department of Transportation is spending $28.9 million on the construction of a new frontage, which connects Broadway Avenue (SR 14) with Pershing Avenue on the west side of I-77 and moves the Broadway Avenue entrance ramp (to I-77 south) to Pershing Avenue via a new Frontage Road on the west side of I-77 in the city of Cleveland. It also is replacing the Broadway bridge. 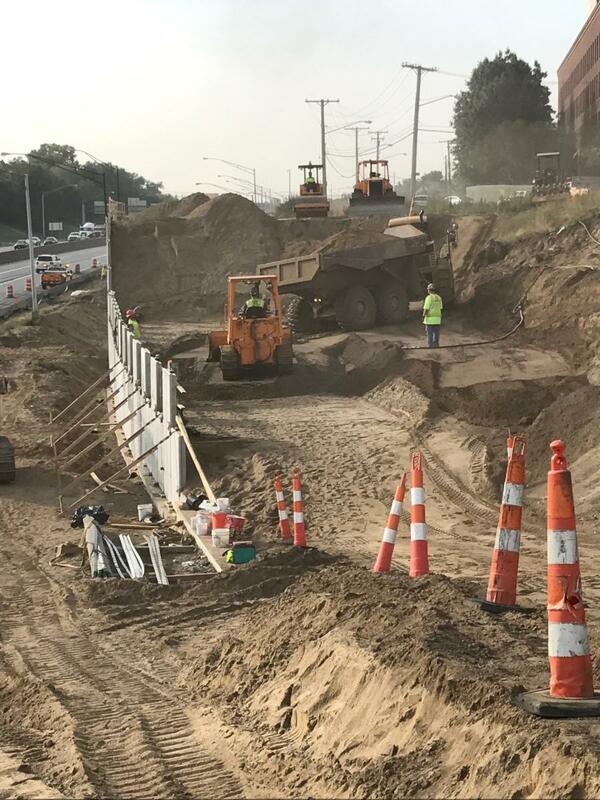 The Kokosing Construction Company Inc. began the work on new Frontage Road in late spring 2017, resulting in the closure of the Broadway Avenue entrance ramp to I-77 southbound. The new Frontage Road now provides Broadway Avenue motorists access to I-77 southbound via Pershing Avenue. Construction of the project is funded by 90 percent federal/10 percent state transportation funds (ODOT's TRAC process/major-new construction funding program). “This project provides infrastructure improvements that will enable ODOT to widen I-77 north and south from two lanes to three lanes in each direction over I-490,” said David Lastovka, Cleveland Innerbelt Corridor Project manager. “The project replaces the existing Broadway Bridge over I-77 with a longer span bridge. Additionally, this project removed the existing Broadway Avenue (SR 14) entrance ramp to I-77 south. That entrance ramp is being replaced with a frontage road from Broadway to Pershing, where traffic can then enter I-77 south. The consolidation I-77 south entrance ramp traffic allows the third lane of I-77 south traffic to better merge with the system ramps from the I-490 interchange. The reconstruction of the bridge started on March 2 and will see a nine month closure of the structure. Traffic on I-77 north and south at Broadway Avenue has been shifted to the right in preparation for overhead bridge demolition and construction operations expected to be complete in late-2018. During the closure, motorists will be detoured via the new Frontage Road on the west side of I-77, with the Frontage Road being open for two-way traffic during the closure. To facilitate the construction work, Gallup Avenue will be closed between Broadway and Lester avenues to facility the bridge reconstruction work. The design for the design-build project was prepared by E.L. Robinson Engineering of Ohio. “One of the biggest design challenges on the project was construction of the 63-degree skew bridge for Broadway over I-77,” said Lastovka. “Spans for this bridge are 221 feet 8 in. and 163 feet and 6 inches. Broadway had a general appraisal of a six and was built in 1963. This project was driven more by need to widen I-77 than bridge conditions. “The new Broadway bridge is being built with 9.5 feet deep precast, post-tensioned concrete beams, a first for ODOT,” he added. 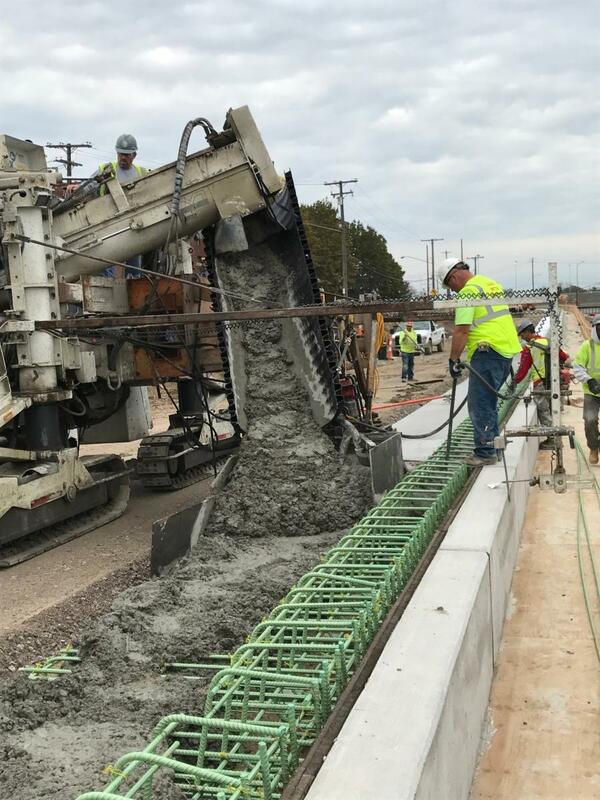 “Due to the large number of underground utilities on a relatively small project footprint, E.L. Robinson Engineering utilized four different retaining wall types, including a retaining wall constructed using jet grout soilcrete columns with a cast in place facing. The new bridge is designed to current design standards and can handle heavy truck traffic.” Construction for the new multi-use path on the west side of I-77 between Broadway and Pershing will continue through spring 2019, with pedestrians being detoured via Roseville Court and East 45th Street, save for the paved portion of the path between Czar Avenue and Pershing. 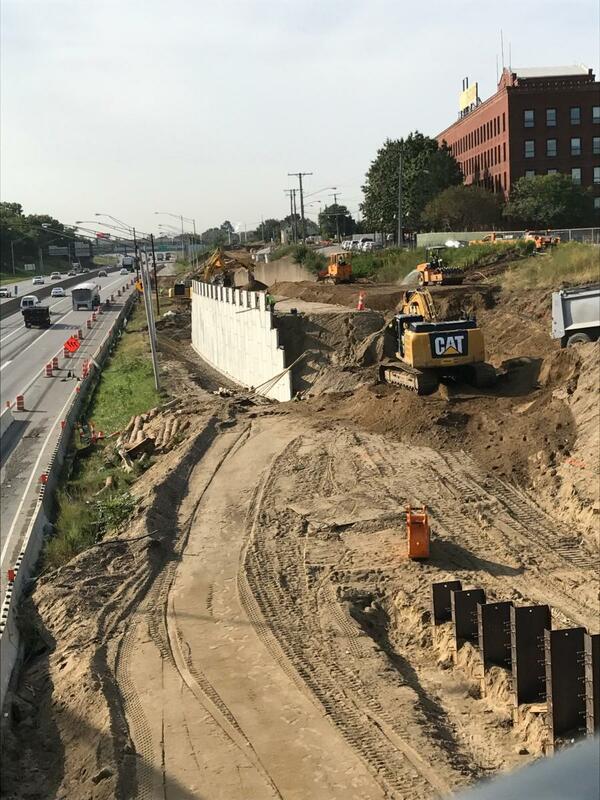 Kokosing has completed a retaining wall to support the new Frontage Road that connects Broadway to Pershing. Broadway was closed on March 5 and bridge demolition started five days later. To meet the aesthetic requirements, brick liners will be placed on the two abutments and pilasters. Bridge decking will then begin the end of August, with an anticipated deck pour around mid September. Kokosing also has to seal the MSE wall that was constructed last season. The I-77 bridge work is taking place nearby, along with other ODOT projects, which makes it a crowded area with lots of materials and equipment being brought in and out of the area. Most of the work is done by day, although there have been a few night shifts, which has about 45 plus construction workers on site. They recently worked on eight consecutive Saturdays to keep the project on schedule. There are no plans to do any winter work after the start of December, with crews returning to the job in early March. Unlike other nearby projects, there are no soil issues on this one. “We're working in sandy conditions, which for our purposes,” said Weaver, “has been very helpful. Nothing has come up that has really halted the project, but the biggest challenge for me has been getting through all the requirements for getting the beams under production. These are monstrous beams, so just getting them produced to getting them trucked here, which has not occurred yet, is a challenge. The delivery trucks will be needed to help with installation. Weaver's team has already assembled the personnel and equipment to off-load the beams. “Things come up and you have to be ready to adjust,” he said, noting that while bringing in crews and equipment is not a problem, the work site is confined, which creates its own difficulties. Kokosing and ODOT are streamlining some coordination issues for this project in light of all the ongoing work, but this has not affected the road construction, which is fairly straightforward. For the utility relocations, seven of the eight companies are cooperating with Kokosing, and the situation is improving with the eighth as the project progresses. Kokosing and E.L. Robinson have excellent relations with the ODOT team for the project. Weaver has two assistants on this project — Project Superintendent Steve Linder and Project Area Manager Scott Mesick. The amounts of steel, concrete, asphalt, sand, and other debris that crews are removing is still being determined, as are the new materials for the project. The steel beams have been sent to local recyclers and the sand, which is much sought after, has been picked up by companies that wanted it. On this project, Kokosing is using Manitowoc 180 cranes; excavators ranging in size from Komatsu 228 to 490; Cat dozers with GPS systems — D6Ns, D6Ts and D8s; John Deere 650 dozers; John Deere 624 loaders: and Vermeer 758 and 755 trenchers. A Manitowoc 16000 S3 crane, with a lifting capacity of 296,000 lb. and 60,000 lb. of counterweight, is being rented to lift the concrete beams. Darrell Grimwood is Kokosing's primary onsite head mechanic, and Weaver noted how Grimwood and his crew are keeping the fleet in solid shape. Kokosing purchases and rents equipment from dealerships such as Ohio Cat, the Columbus Equipment Company, United Rentals and Sunbelt. Weaver noted the original construction work was well done and that his crews have to be careful when dealing with the older brick manholes and sewers in the area. The recent heat wave had crews starting at 6 a.m. instead of 7 a.m. to avoid some of the hot temperatures and ensuring that there was plenty of bottled water available on site. Pallets of water were delivered to meet the need, and an ice machine was installed outside Weaver's office. “We told people to take a break if they needed one and go into an air-conditioned truck if they needed to cool off,” he said, pointing out that the equipment operators have air-conditioned vehicles. “The people that we were worried about were the carpenters and laborers. The crews were preached to every morning about safety in these extreme conditions. Our goal is always zero incidents — job site and company-wide — and so far so good this season. We have plans if something goes wrong, but the goal is zero and we preach that daily. “We dedicate the first 15 minutes of every morning to discussing the plan of what we are trying to accomplish that day and the hazards associated with it,” he added.